The quality-control approach is focused on the process, whereas the problems that customers may face can also occur elsewhere in the production and distribution chain. Quality assurance systems take a much wider view of what is involved in satisfying customers' needs, and focuses on the prevention of problems and not simply on their cure. Curing problems is expensive and quality can't be ''inspected into'' a product (23). Quality assurance can be defined as a strategic management function that establishes goals and provides confidence that these measures are being effectively applied (24). Quality assurance is the set of systematic and preestablished actions necessary to provide adequate confidence that a product or a service meets the given quality requirement (25). A quality assurance approach includes the whole production and distribution system, from the suppliers of important raw materials, through the internal business management to the customer. Quality assurance systems should be documented in a simple way to show who has responsibility for doing what and when. The focus of quality assurance is prevention, and this should mean that action is taken to meet a specification and prevent failures from occurring a second time. This is done by planning, management action, and agreements with key suppliers and other people in the distribution chain (23). Quality assurance can only be accomplished when staffs are well trained and motivated. Workers are normally well aware of the causes of most problems, and when quality assurance is used properly they can resolve most quality problems within their control. It is the responsibility of business owners to ensure that the quality assurance system, together with any necessary equipment and information, are available to the workers to allow them to exercise this control. A range of problem-solving techniques can be provided for process workers to use when trouble arises during production. These simple techniques are tried and tested. They involve problem identification, analysis of the cause, suggestions for solutions and implementation, and feedback methods. These techniques allow the operators more control over their work and allow problems to be prevented rather than solved. More advanced statistics-based methods can be used for sampling plans and process optimization, but these are beyond the scope of this book. Fermented dairy products were originally developed as a means of preserving raw milk in times of excess production and are generally considered to be relatively safe foods. However, several reported outbreaks of foodborne illness have been associated with these products. Organisms such as Listeria monocytogenes, Salmonella, Brucella melitensis, and Escherichia coli O157:H7 have all been involved in cheese-associated outbreaks, causing severe illness and some deaths. Listeria monocytogenes can cause meningitis and blood infections and abortion in pregnant women; some types of Salmonella can cause blood infections and may result in long-term illness such as reactive arthritis; Brucella melitensis causes undulant fever. The disease persists for months if left untreated but is seldom fatal in humans. Toxin-producing types of Escherichia coli (including E. coli O157:H7) may cause hemorrhagic colitis, hemolytic uremic syndrome, and renal failure, which may result in death, particularly in young children. Outbreaks have occurred when milk pasteurization was not carried out properly and when cheese made from pasteurized milk was subsequently contaminated with pathogenic microorganisms. More recently, an outbreak of Staphylococcus aureus enter-otoxin in pasteurized milk resulted in over 14,700 cases in Japan (26). Other prevention and control measures include employing Good Manufacturing Practices (GMPs), Standard Sanitation Operating Procedures (SSOPs), and Hazard Analysis and Critical Control Points (HACCPs). It is well recognized that HACCP can be an effective management tool for reducing the risk of food safety hazards in the food supply. HACCP is a commonsense approach that is based on a preventive rather than a remedial approach to food safety. The FDA has mandated HACCP for high-risk food industries, such as seafood and fruit and vegetable juices, and the USDA requires processors of meat and poultry to develop and implement HACCP programs. Many in the food industry not currently under HACCP regulations realize that a HACCP program makes sense and have voluntarily implemented HACCP programs. Although there are no federal regulations requiring HACCP for manufacturing of dairy products, programs are being initiated in some states, and HACCP appears to be the direction for the future. The International Dairy Foods Association (IDFA) recently published a HACCP plant manual for dairy products (28). The manual provides technical recommendations for development of a comprehensive HACCP food safety system for the entire dairy industry, including specific prerequisite program, preliminary steps, assessment of hazards, hazard analysis guideline, seven HACCP principles, and model HACCP programs covering different dairy products. Good Manufacturing Practices (GMPs) are required by law for all food manufacturing companies. Information on GMPs can be found in the Federal Code of Regulations (CFR) section 21, part 110. GMPs are the foundation and prerequisites for all food safety and food quality programs. GMPs ensure the production of safe and wholesome food of high quality. GMPs are prescribed for four main areas of food processing as outlined in Table 3. The specific operation procedures in dairy plant can be found in the International Dairy Food Association (IDFA) HACCP plant manual for dairy products (28). Portable or centralized foam cleaning equipment with foam guns for air injection into the cleaning solution Same as above Portable or centralized high-pressure, low-volume equipment; sprays should be rotary hydraulic Pumps, fan or ball sprays, and CIP tanks a Packaging equipment can be effectively cleaned with gel cleaning equipment. Source: Ref. 31.
chemical sanitizers. Their applications in dairy processing plants are described in Table 5. In addition, the quality of water is critical because water is the major constituent of almost all cleaners. Because most plant water is not ideal, the cleaning compounds selected should be tailored to the water supply or should be treated to increase the effectiveness of the cleaning compound. It is especially important to reduce suspended matter in water to avoid deposits on clean equipment surfaces. Water hardness complicates the cleaning operation. Suspended matter and soluble manganese and iron can be removed only by treatment, whereas small amounts of water hardness can be counteracted by sequestering agents in the cleaning compounds used in the sanitation operation. If the water is hard or very hard, it is usually more economical to remove or minimize water hardness. Steam Maintain steam in contact with product contact surface for 15 min when condensate leaving the assembled equipment is at 80°C. Used less in dairy plants because it is difficult to maintain at constant required temperature, energy costs are high, and steam application is more dangerous than other methods. Hot water Temperature of water has to be maintained at not less than 76.7°C and not more than 90.6°C for a time period of 30 sec. This technique is expensive because of required energy costs. Chemicals Chlorine, iodine-containing compounds, and quaternary ammonia are the three most commonly used chemical sanitizers. For large-volume, mechanized operations, sanitizer can be applied through sanitary pipelines by circulation or pumping sanitizing solution through the system. For small operations, equipment, utensils, and parts can be sanitized by submission in sanitizer solution. Closed containers (tanks or vats) can be effectively sanitized by fogging. Source: Refs. 30 and 32. The techniques for cleaning dairy plants vary depending on the plant size. The major portion of a large-volume plant is cleaned by the Cleaning-In-Place (CIP) system, which is the recognized standard for cleaning pipelines, milking machines, bulk storage tanks, and most equipment used throughout the processing operation. However, many small parts of equipment and utensils, as well as small containers, can be washed effectively in a recirculating-parts washer, called Cleaning Out of Place (COP) unit. The COP units contain a recirculating pump and distribution headers that agitate the cleaning solution. A COP unit can also serve as the recirculating unit for CIP operation. The effectiveness of the CIP approach depends on the process variables, time, temperature, concentration, and force. Cleaning and sanitizing agents should be used exactly following the product directions. Rinse and washing time should be minimized to conserve water and cleaning compounds but should be long enough to remove soil and to clean effectively and efficiently. Temperature of cleaning solution should be as low as possible and still permit effective cleaning with minimal use of the cleaning compound. CIP operations in dairy plants are usually divided into two major categories: spray cleaning and line cleaning. The detailed description can be found in Marriott (30). A current trend has been toward modification of CIP system to permit final rinses to be utilized as makeup water for the cleaning solution of the following cleaning cycle and to segregate and recover initial product-water rinses to minimize waste discharges. Eight cleaning steps in dairy operations are recommended. Their specific applications are described in Table 6. Covering materials should be polyethylene or equivalent. This task should be accomplished during the production shift and/or prior to prerinsing. Prerinsing can remove up to 90% of the soluble materials and also loosens tightly bound soils and facilitates penetration of the cleaning compound in the next cleaning step. This step can be simplified through proper selection and use of processing and clean equipment, proper location of equipment, and reduction of soil accumulation. Further reduction of soil buildup is possible through use of the minimum required temperature for heating products a minimum amount of time; cooling product heating surfaces, when practical, before and after emptying of processing vats; and keeping soil films moist by immediately rinsing foam and other products with 40° to 45°C water and leaving it in the processing vats until cleaning. This step solubilizes and carries away soil. Rinsing also removes residual soil and cleaning compounds and prevents redeposition of the soil on the cleaned surface. Inspection is essential to verify that area and equipment are clean and to correct any deficiencies A sanitizer is added to destroy any residual microorganisms. By destruction of microorganisms, the area and equipment contribute to less contamination of the processed products. Seven principles are included in developing a HACCP program. They are listed and briefly described in Table 7 (33). Step 1. Conduct a Biological, chemical, and physical hazards are conditions that may pose hazard analysis an unacceptable health risk to the consumer. During the hazard analysis, all food safety hazards associated with each specific step of the manufacturing process are listed and those that are significant are identified. Step 2. Identify critical Critical Control Points (CCPs) are steps at which control can be applied control points so that a food safety hazard can be prevented, eliminated, or reduced to acceptable levels. Examples of controls include pasteurization, cooking, curing, acidification, or drying steps in a food process. Step 3. Establish critical All CCPs must have preventive measures that are measurable. Critical limits limits are the operational boundaries of the CCPs that control the food safety hazard(s). They might include pasteurization time/ temperature limits, end cooking temperature, or product pH. Critical limits are set according to regulations in place (pasteurization of milk or cold holding temperatures at retail), experience with a product, research data, or in consultation with food safety authorities familiar with your product process. If critical limits are not met, the process is ''out of control,'' and it is possible that food safety hazard(s) are not being prevented, eliminated, or reduced to acceptable levels. Step 4. Monitor CCPs Monitoring is a planned sequence of measurements or observations to ensure the product or process is in control (critical limits are being met). It allows processors to assess trends before a loss of control occurs. Adjustments can be made while continuing the process. The monitoring interval must be adequate to ensure reliable control of the process. Monitoring could include checking temperatures of a cooler twice per day, the use of a continuous temperature monitoring device on a pasteurizer, or a pH test. Step 5. Establish corrective HACCP is intended to prevent product or process deviations. However, actions should loss of control occur, there must be definite steps in place for handling the product in question and for correction of the process. Corrective action plans must be thought out and written as part of the HACCP plan, not determined at the time of the deviation. If, for instance, a cooking step must result in a product center temperature between 165°F and 175°F, and the temperature is 163°F, the corrective action could require a second pass through the cooking step with an increase in the temperature of the cooker. Step 6. Record-keeping The HACCP system requires the preparation and maintenance of a written HACCP plan together with other documentation. This must include all records generated during the monitoring of each CCP and notations of corrective actions taken. Usually, the simple record-keeping system possible to ensure effectiveness is the most desirable. Step 7. Verification Verification has several steps. The scientific or technical validity of the hazard analysis and the adequacy of the CCPs should be documented. Verification of the effectiveness of the HACCP plan is also necessary. The system should be subject to periodic revalidation using independent audits or other verification procedures. HACCP Plant Manual (28) describes specific guidelines for developing and implementing even steps of HACCP in dairy plants. Model HACCP programs for milk and milk products, frozen desserts including ice creams and yogurts, cheeses, and butter are provided. Here are the practice guidelines for designing and implementing HACCP in dairy operations. 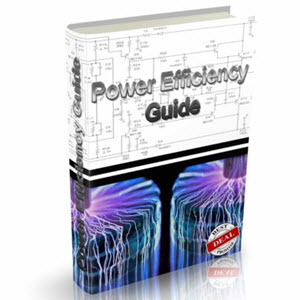 Set up a record-keeping system that is easy to use and easily accessed. Product records need to be reviewed before shipping. Keep for your records minutes of discussions related to hazard evaluation, selection of critical control points, critical limits, potential monitoring activities, corrective actions, and so forth. Begin the HACCP process early. Involve and use the experience and knowledge of people involved in each step, process or department. Train employees so that they know what they are supposed to do and when they are supposed to do it. Take a look at problems you have had in the past. Address those problems in your HACCP plan. Activities covered by your SSOPs or GMPs probably do not need to be included in your HACCP plan. Once you have developed your flow diagram on paper, go out into the plant and verify the flow diagram. Check product flow and employ related activities. Once you have a HACCP plan draft, test it out in small segments. Reassess your plan often in the beginning. Later you may need to reassess only 1-2 times per year. Once your HACCP plan is in action and reassessment is made, document when and what changes are made to the plan. When changes are made, it is important that the plan and employee-related duties changes are made at the same time. Establish a plantwide feedback system for continuous improvement. Document in your plan where records are stored. Store HACCP records that need to be accessed separate from other company records. Say WHAT will be done, HOW it will be done, and WHO will do it—then, DO WHAT YOU SAY. In general, fermented dairy products are considered to have a low risk of causing food poisoning because they contain natural acids that prevent the growth of foodborne bacteria. Processing, such as fermentation (lowering pH) and heating (pasteurization), also reduces the risk of contaminating bacteria. However, the products can be infected with pathogens during processing or after. Processors should start with good-quality raw materials and have strict controls over hygiene and handling. The generalized process flow chart for fresh cheeses is shown in Figure 3 and a summary of the main quality assurance procedures for fresh cheese processing is shown in Table 8. The quality assurance procedures in the table are discussed in more detail in the following sections. Figure 3 Generalized production flow chart of fresh cheese (cottage cheese). determining milk quality. The PMO standards on grade A pasteurized milk are illustrated in Table 9. Other raw materials used in the production of fermented dairy products, including starter cultures, rennet, and packaging materials, have to be subject to examination, too. The standard methods for the examination of milk and milk products can be found in Marshall (34) and Fox et al. (35). Calibrate thermometers in the pasteurizing unit to ensure the correct temperature readings. Reject milk not heated to the required temperature for the required time, and redirect it through the pasteurizer again. Check at startup that the flow diversion valve on continuous flow pasteurizing units are operating correctly. Receive milk from farms, and purchase starter cultures and rennet supplies. Record amount and quality of milk and other raw materials. Pasteurize milk, adding start culture, rennet, curd setting; cut, drain, and wash curd to make required products. Fill product into packages, seal and label. Pack into distribution boxes. Store finished product. Dispatch products in required amounts to retailers or customers. Arrival temperature of milk should be <10°C, and storage at <6°C. Starter cultures and rennet should be stored at cold and dry places. Specification of milk quality based on the total colony counts, inhibiting substance, composition, etc., microbiological examination, activity tests, and absence of contamination on starter cultures. Training in accurate weighing and keeping records of ingredients used. Preparation of processing schedule and training of operators to ensure: control of temperature and time of heating correct amount of starter culture and rennet added at the correct time in the processing Establish standards for operator hygiene and schedule for cleaning of equipment and processing room Establish specifications for package quality, labels, and fill weight. Implement inspection, check-weighing, and recording procedures. Control store room temperature and implement cleaning schedule and stock rotation procedures. Ensure records are kept. Establish inspection and recording procedures to ensure that customers receive the correct product in the amount specified. Regularly monitor the results of phosphatase testing of pasteurized milk to ensure that the heating plates of the HTST pasteurizer do not leak. Maintain, correctly calibrate, and service equipment regularly. Packaging, storage, and distribution should be performed in such a way that product is protected against contamination through the following measures. Packaging of milk and milk products shall be done at the place of pasteurization in a sanitary manner by approved mechanical equipment. Cottage cheese, dry-curd cottage cheese, and reduced-fat or low-fat cottage cheese may be transported in sealed containers in a protected, sanitary manner from one plant to another for creaming and/or packaging. Seals on lids should have close and continuous contact with the container rim. Plastic and glass seals should not be contaminated with product or else the seal will leak. How cheese is made flowchart? How to make a cheese flow chart? How to make a milk cream flow chart? 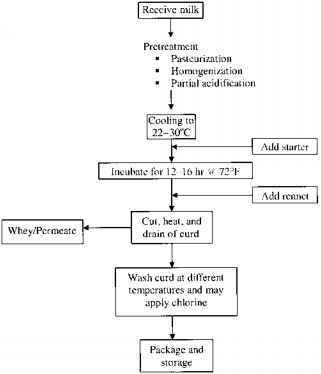 How to make a butter from milk flow chart? How is milk pasteurised flow chart? How to make cheese flow diagram? Are are garments made in industry flow chart? Which is a raw material of fermentation? How is milk processed images for flow diagram?